I'll be damned if this isn't a (dark) red ale. The creamy head becomes a lilly pad within a few minutes, and the aroma is pretty damn overwhelming for a red ale. I know that red ales sometimes have more character than, say, a Killian's, but this is definitely strong. the malt is just jumping out of the glass. 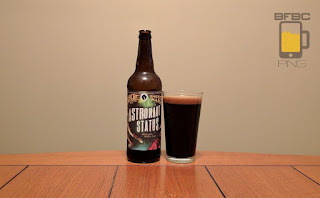 Bearded Iris - these guys try. Do they succeed? Yes and mostly yes. Even their worst beer is still not the worst thing ever. And their better beers are pretty damn good. They seem to like to make ales, and I'm certainly okay with that. My prediction was that this, like every other Bearded Iris beer I've had so far, would be a murky kind of juice-like yellow-gold. Sure enough, this is lighter in color than the others, but it could totally pass for a juice of some dank citrus fruit. The aroma does not follow, though. 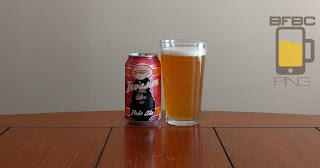 It is fruity, but it has a solid thick-crust biscuit malt really nailing it down. The head leaves a ton of lacing - possibly the most of any Bearded beer I've seen. Mantra is pretty much one of the golden children at this point. These people produce some damn good beer, and they know what the hell they're doing. Will they be able to use their particular set of skills to make a saison that is worthy of the brand they are trying to build? Let's find out. The amber beer with the white head has an aroma of lemons, orange rind, spices, and doughy bread. It's complex and exciting with the patchy bubbles floating on top and the very slight lacing on the sides of the glass. First sip is not excessively nice. It is sweet and harsh with grains and spices overwhelming the malt and any hops that might have been in there. Instead, this beer just kind of slaps the tastebuds with all the spices and even a pretty hard yeast. I guess a full swig might sort it out a bit, and I don't want to continue to sip this thing. Wiseacre has been pretty darn good to me so far. 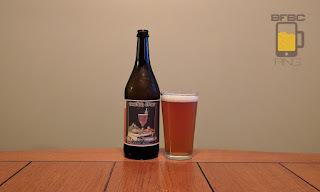 I've had this beer waiting for me for a few weeks, and I don't know why I was putting it off (aside from the fact that the label is pretty cruddy). Well, I guess there is my fear of bourbon barrel aged beers, but I found at least one that I really enjoyed, so I welcome others to try. The black-as-night beer has a red tinted tan head. The aroma is sweet bourbon and chocolate with some berries tossed in for good measure. There's smoke in there to compliment everything, and it seems to be performing as intended. All told, I already wanted a beer, and I want one more now. First sip is a pointy mixture of bourbon, chocolate, and berries. There's a strange mix of sweet and tart going on with the whole thing, and I'm pretty sure I taste vanilla on my lips when the whole thing is through. A proper swig will tease out the true flavors. We here at BFBCPing.com are all about you, the reader. 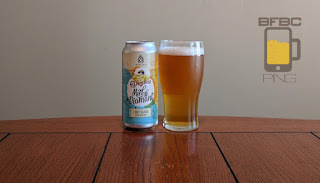 When you see a review for a brew from Nebraska that has the imagination to call themselves... Nebraska, you demand that I try it out, so I tried the first one. Was that enough? No. Instead, you demand even more of me with this second brew from the cornhusker state. If you said that this beer is the color of wheat - with all the shades that entails - I wouldn't fault you. The stark white head is quite voluminous, even though I took great pains to try and dribble the beer slowly down the side of the glass. The lacing is thick and patchy, and the haze is a clear indication that this was bottle conditioned because they love me. The aroma is thick Belgian yeast with a heavy handed helping of grains. Bell's could only let me down after the hit of the Two Hearted Ale. As a result, all of the other Bell's beers have not been able to measure up, but some have been pretty good. This is the latest that I found from them, so I'm going to keep chasing that dragon - I will find the beer that matches that ale. 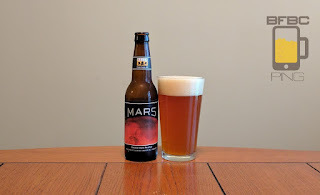 I don't know why, but I expected a beer called Mars to be red. I know, this is a DIPA, not a red ale, but that's what I expected. Instead, this is a copper colored beer with a sticky white head with big bubbles and the lacing is tremendous. The aroma is citrus and bread dough. I don't mean like bread or like biscuits or anything else. If you had a handful of wet bread dough in the middle of being kneaded, you would know what this smelled like. Dogfish Head is pretty consistently in my 3-4 range, and that is a damn good place to be. As my 2.5 rating is an average beer, so that means it is good enough to order when you're at a bar, anything above a 3 is a very good beer. This one looks like they printed the label on a 1990 Cannon Bubblejet printer. I have no idea why this label looks so much worse than the usual ones, but it is what it is. 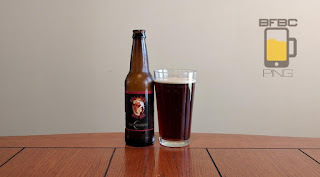 The beer is a nice copper-amber color with a fluffy enough head that sadly leaves almost no lacing. The aroma is very faint, and it is mostly grains and grapes. More grains than anything, really, but there's not that much in the aroma in the first place, as you may recall me saying earlier in this paragraph. 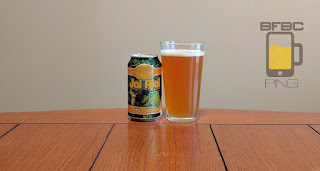 Another Cigar City beer. 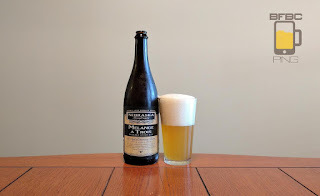 The previous two were a little less than what I expected, but this is a Belgian white so... actually, these things tend to be kind of all over the place, so who knows what this Florida brewer is going to do with it? Well, I will in just a minute - come with me to find out. 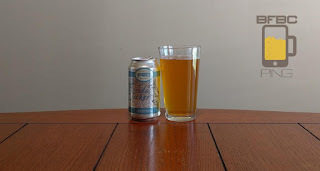 The hazy, honey-colored beer briefly had a white head, and I mean briefly. That head ran away like something with big, scary teeth was chasing it. Now, it gives the impression of a gold-flaked used dishwater. The aroma is a pleasing sweet, grainy malt with citrus highlights. So, the looks are always nice to write about, but let's taste it. First sip is solid grainy malt and citrus with an unmistakable coriander and spicy kick to it. It is like a jab in the tongue, as there is a lot going on for the mouth to process. But that's why we swig next, isn't it? Another crappy label. At least this one is easier to read than the first one, and the beer inside it might be just as different and improved over that one. I mean, that one wasn't terrible, and this pale ale produced by the same brewer might be able to fix the things that were wrong. 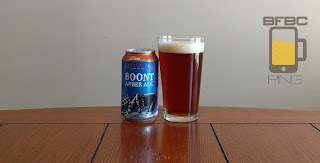 The hazy, dull amber beer has a head that likes to leave a little lacing, so it must like me. The aroma is very slight, but it is bready malt and distinctly citrus malt. So, is this just a milder version of its sister? A smell won't tell me. First sip is a kind of tangy, weak citrus juice with that malt kind of hanging around, trying not to look too overpowering. That's pretty good, as the last one had way too much malt on the front end, and the hops could never make a proper recovery. So, the sip was not bad. How will a swig do? My first beer from Florida, and they totally have no idea how to make a label. Seriously, these colors are just wrong for this label, and I had a hard time reading the brewer's name, the location, and the ABV. This is a terrible label. This will go down in the annals of history as one of the worst labels ever. But I'm here for the contents of the can, so let's dig in. The beer is a copper and honey color with a nice white head that is... clumpy more than sticky. Lacing is pretty minimal, but I've seen worse. The aroma is simply dripping with citrus and tropical fruits. So, clearly we have some citrus hops in our IPA, and we seem to have so much that there isn't really much malt getting through, but what there is kind of grainy.